The device comes pre-loaded with the SanDisk SecureAccess software for password protection and 128-bit AES encryption. SanDisk has launched its latest Ultra Fit USB 3.1 flash drive, which is priced starting at Rs 800 for the 16GB storage model and goes up till Rs 7590 for the 256GB storage variant. The company says that the device can deliver up to 130MB/s read speed. It comes with a five-year limited warranty as well. 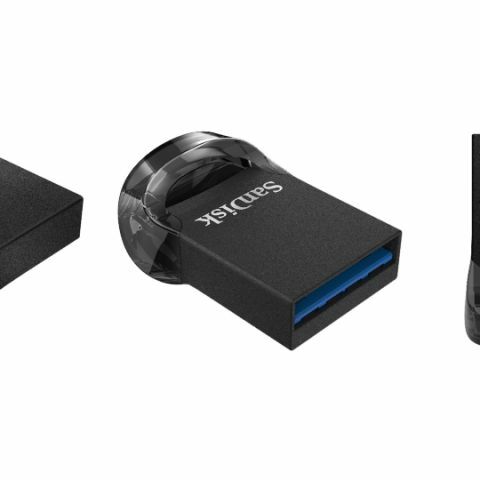 The new SanDisk Ultra Fit USB 3.1 high-speed flash drive is compact in design allowing users to plug and leave it in, making it simpler to add extra, high-speed storage to their device! Just by plugging it in the user can instant storage for their devices. SanDisk Ultra Fit USB 3.1 Flash Drive enables write speeds up to 15x faster than a standard USB 2.0 drives. With this flash drive, a full-length movie can be moved in less than 30 seconds plus it includes SanDisk SecureAccess software for password protection and 128-bit AES encryption software making it easy to password-protect critical files. The user just needs to drag and drop files into the vault, and they'll be encrypted to keep the private files private. The drive comes with a RescuePRO Deluxe data recovery software download offer. This software allows recovery of files that have been accidentally deleted (download required). It is also backwards-compatible, so it can be plugged into any USB 3.0 or 2.0 port. A perfect companion for people who need an always available extra storage on their devices for media and more, SanDisk Ultra Fit USB 3.1 Flash Drive features a five-year limited warranty and comes in 16GB/32GB/ 64GB/ 128GB/ 256GB capacities with up to 130MB/s read speed. Best gaming cabinet/case under Rs.5000/- which can fit CM Hyper 212x cooler ? ?